The featured painting for September 2012 is entitled “Portrait of H.L.”. This painting resides in the UK in a private collection. 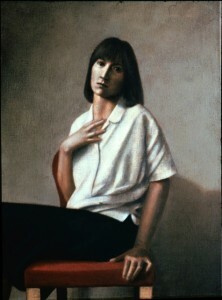 It is a portrait of a former girlfriend of Ian’s and was submitted as an entry in 1986 to the B.P. Portrait competition for the National Portrait Gallery.